discontinued this spray paint. You can read about a better paint option here. I didn't love oil rubbed bronze until I moved into the cottage. I usually veered towards silver or brushed nickel, but this house already had some oil rubbed bronze light fixtures that I quite liked and the house had a warmer feel overall that I thought I ought to stay true to. It's almost black, but a little warmer. It has some sheen, but not too much. It's also very durable. What more could you ask for? OOPS! I guess the potty training never ends. Even when they're 14. OMG! This is awesome! Those fixtures look great! We have gold door knobs throughout our house...I'd love to spray paint them (I've read about it in a blog) but I'm afraid that with use...it won't hold up! Yours on the other hand looks great! That has got to be the coolest tip ever! Thank you so much for sharing that. I am spying my brassy 80ish chandy and I can't wait to try this!!!! I love that spray paint! I have a question - have you tried painting the trim around a shower door? I have a huge walk-in shower with the glass door and glass window, all trimmed out in bright brass. I would love to re-do my bathroom fixtures with paint, but would still have to somehow replace or repaint this. How does that paint hold up to moisture? If it would work it would certainly solve a huge decorating problems for me! Thank you for sharing. If I could be around the fumes I'd do my doorknobs in a heartbeat! Linds - I have friends that have painted doorknobs and they've held up very well. If you're concerned I'd paint on knob first that gets a lot of use and see how it holds up. If it doesn't, then it's inexpensive to replace just one. Gena - I don't think it would be a problem to paint the outside frame of a shower door. I'm not sure about the inside. There may be a water proof clear coat you could spray over the top. I'd probably check with some "experts" though before trying it...unless you're willing to give it a shot and replace the door if it doesn't work. Thanks for your comments gals! What a great look with spray paint! Did you spray directly onto your fixtures or did you have to prime them first? O.K. this spray paint makes me giddy! I havebeen out of painting for a while and girl, NOW IT'S ON! Good thing my husband is out of town for a few weeks. Heeehehehehehehehehee Giddy I tell you! I just found you through the Nester's site, and I have to tell you I am addicted to this spray paint. I have sprayed switch plates, wall sconces, picture frames and a tray this color.You are right, it is great when you are thinking black, but with a bit of shine! I'm so happy to have found someone else with my same addiction! Hi, The Nester had you linked today. I browsed on over here and found exactly what I've been looking for! Nice bronze spray paint. Please tell me; was this the "aged bronze"? They have classic bronze and aged bronze. What store did you find this in? I checked our WalMart and they carry this product but I don't remember seeing this Metallic Bronze. Thanks so much! I love your blog. Your home is turning out great! Good questions Andrea. The paint I used just said "Oil Rubbed Bronze". It didn't specify if it was aged or classic...so I'm assuming classic? I actually had to check a couple different stores to find it, but ended up finding it at Home Depot. I bought 5 cans in case I couldn't find it again...you know, for those spray paint emergencies...LOL. Another fan of this paint here...but at our Lowe's they had it pulled/discontinued about a month or so ago. I bought the last of what they had. I don't know if that means anything about this paint and other retailers or not. I love this! I have been searching for the oil rbbed bronze but can't find it anywhere. What is the name on the label, i can't quite read it. It looks great! I have been to Lowe's and Home Depot this past weekend and could not find the color on the shelf. The clerk at Lowe's said they were not carrying the color of oiled rubbed bronze anymore in spray paint by Rust-Oleum or any other brand. Any idea where I can buy a can? I just redecorated my kitchen with oiled rubbed bronze faucet, cabinet handles and napkin holder. I want to paint my gold metal plate stand to match. I have one can that I tested a 3x3" spot and ended up not liking it. If you're interested in it let me know. It's only one can unfortunately. I found Rustoleum makes a textured oil rubbed bronze but is much more brown. Also they have "Bright Finish" in bronze which is closer to the oil rubbed. I see you have a can of paint and are talking about oil rubbed bronze. Is the color of the paint you used oil rubbed bronze or something else? Yes, I too love this paint... I've painted my cabinet door hinges as well as my vents with this stuff over 6 months ago and all has held up perfectly. SO... how did those door knobs turn out? I'm thinking about doing mine. I love this paint! Why would they discontinue it? I have painted frames, clocks, bathroom fixtures, a TV stand, a coffee table, vases and want to paint more! I just went to Home Depot yesterday to get more...... Sad day indeed. Gena, Did you ever try painting the shower door trim? That's EXACTLY what I'm wanting to do and wondered if it could possibly work. Just to let you know the Oil Rubbed Bronze Paint from Rustoleum HAS NOT been discontinued. I have a client that works for the company and she said you can purchase it at most home improvement stores. Yea!!! I am soo excited and planning to run out and look for this paint today. I am hoping to do my shower trim as well so if anyone has tried it - please post your results asap! American Accents can also be found at Michaels craft stores. Not sure if they carry this color, but since it is a somewhat specialty/craft color, it is a good possibility. So would anyone that knows FOR SURE whether or not the Rustoleum product (oil rubbed bronze) paint is still available, please comment on when and where they purchased it? I too used the paint and loved it, but now am unable to find it anywhere to do more projects. Also, has anyone spray painted their metal portions of their shower door? What were the results? You can find it at Lowes, Home Depot ,Amazon etc. 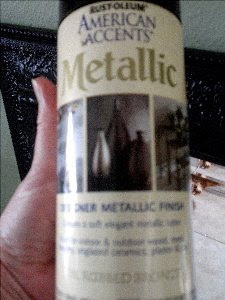 Or just google "Rustoleum Metallics Oil Rubbed Bronze" hit shopping, results will pop up, it's widely available. I too am a fan of this paint, and was needing more to finish my "projects"....but I can't find it anywhere. Been to lowes, home depot, michaels, walmart, hobby lobby, and the local lumber yards. And more ideas?? if this pain is no longer available...what to use. I want to paint an old brass light fixture. Just this past weekend I purchased 3 cans of Rustoleum Metallic Oil Rubbed Bronze at our local Lowe's...it's still out there. And it is fabulous...I have painted mirrors frames, door handles, registers, candle holders, etc all in this color and they all look like I bought them that way. I've had a lot of compliments as well! I wonder if you can paint a shower head and extension arm with this paint? My Lowe's carries this spray paint although the can looks different. But it is oil rubbed bronze. I have also seen Krylon ORB at Wal Mart. So, I'm not sure what type of metal my switch plates and vents are, but it's the most yellow gold colour ever and it's just not my style. We just moved in. This seems like a good option. Does it adhere well to shiny switch plates? It would cost quite a lot to purchase all new hardware. Everything is YELLOW GOLD! Eaks! I've been wanting to spray paint the gold fixtures in our powder room too but didn't know what color to go with and what brand. I am so glad I found your blog in the nick of time. One of your suburbanite bloggers gave the web site that sells the oil rubbed bronze and I am so glad to say I ordered a 6 can. I can't wait to do this project. I am contemplating also spray painting the gold faucet and the gold toilet flush. I noticed you left those out in your project. Any good reason why I should not spray paint those? We just bought ours at ACe Hardware. Its made by Kryon. You can google it as well if you dont have an ace hardware in your area. Can the chrome towel bars be changed with the oil rubbed bronze spray paint? How did the trim on the shower doors and the faucets turn out? Great blog. I hope I can find the product. It looks GREAT!! I am wondering though, if you used a clear coat over the oil rubbed bronze paint? If so, gloss or matte? I just purchased oil rubbed bronze towel rack, tp holder, toilet handle, etc. for my bathroom, but I have a large sliding mirror medicine cabinet that has a chrome frame on the top and bottom. I am going to try the oil rubbed bronze paint, but wanted to know about a top coat. Thanks!!! Hope mine turns out as nice as yours! I found your blog while google-ing 'can i paint my kitchen knobs rubbed bronze'. First let me say, I LOVE YOUR BLOG. It's going to be my new GO TO. Second, let me say my kitchen cabinet knobs? They look awesome. I was about to spend over $100 on new knobs because I wanted to aged bronze look, and now? I've spent $5. Thanks for the suggestions. I love this look but it can be pricey. I've done a few things in my home by layering colors for a deeper look. I spray black on bottom, then copper, and top off with oil rubbed bronze. You can see it at http://www.deconstructingthehome.com. Thanks for all the great advice! Is there a difference in "metallic" oil rubbed bronze Rustoleum or Krylon paint? Do I need a primer? I want to "do" my shiny brass chandelier. I was unable to find oil rubbed bronze paint at local stores but recently ran across Rust-Oleum 243898 on Amazon. It was discontinued in regular stores due to high VOCs. It worked great for updating old brass items. I used fine steel wool, primed, sprayed two light coats, then sprayed on two top coats of polyurethane. It's held up well on a rack that gets used often. There is a newer form out which is supposedly good on all surfaces. 249131 - Oil Rubbed Bronze - not sure if the low VOC version is as good.